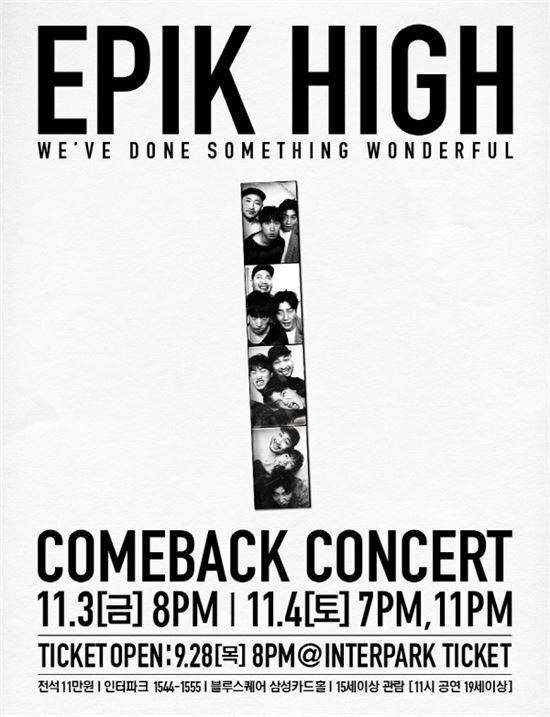 Hip-hop trio Epik High will hold concerts in November for its upcoming album, YG Entertainment announced Sunday. The concerts, titled “We’ve Done Something Wonderful,” will take place on Nov. 3 and 4 at Blue Square Samsung Card Hall in Hannam-dong, Seoul. Tickets will be available starting at 8 p.m. on Sept. 28 at ticket.interpark.com. The alternative hip-hop trio debuted in 2001 and consists of Tablo, Mithra Jin and Dj Tukutz.